Being a meat lover, and a great supporter of the Free Market ... I like to eat out. I trust that a restaurant is revealing to me what I will be ingesting during that meal. The same goes for what meats I buy at a supermarket to eat at home. The product info is usually printed on the package because: The consumer has a right to know. But especially when the information concerns the religious practices of another faith (and an oppressive, misogynistic one at that). 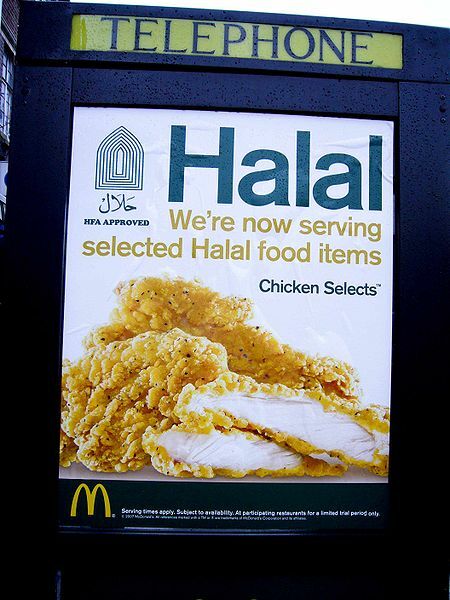 Islamic Sharia Law is being introduced into Western society via Halal food. A soft or stealth jihad ... causing unbelievers to submit to Sharia Law, blindly. Companies who benefit from the Halal process give Zakat (the third pillar of Islam), of which part goes to Jihad. Producers feel that if all meat is Halal, they will not lose any of their market share ... totally ignoring the fact that they are submitting to Islam, AND deceiving the majority of their customer base. Halal is part of Sharia Law, which is one of the most supremacist, misogynist, anti-Semitic religious bodies of laws in the world today. And if this isn't enough ... Halal disrespects the ones the Quran calls "People of the Book": Jews and Christians. According to Jewish Dietary Laws (Talmud Avodah Zarah 29b) and for Christians (Acts 15:28-29), consuming foods offered up to idols is forbidden. Devout Christians and Jews do NOT consider the god of Islam to be the same God they worship. NOR do they recognize the self-proclaimed prophet of Islam, Muhammed, to BE a prophet (that's what caused Muhammed's sudden turn toward hatred and call for the death of "People of the Book" in the Quran). The appalling Islamic supremacy endemic to Islam (and therefore, Muslims), rears its ugly head in many ways. But this form of Sharia imposition is egregious. Some stores have labeled their meats "Halal" BUT apparently it "slipped" their minds to notify their customers ... until a customer found it on a package. That was Costco/Price Club. Another company that slipped the label on their meats is Shop Rite. And who knows how many more are bowing on Islam's prayer rug. Sharia Law requires Halal meat slaughter. According to Islam, the meaning of the Arabic term "Halal" is: "lawful, legal, allowed or permissible under the Shariah (Islamic Law)". If a company wants to cater to this minority customer, fine ...i t's a free market. BUT, to keep the majority of their customers in the dark and greatly disrespect their deeply held religious beliefs, is repugnant. 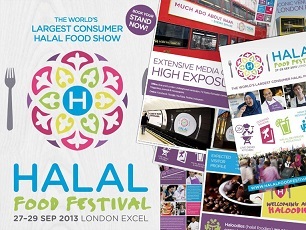 So, as you peruse the labels for healthy ingredients on your next shopping trip ... look for one more 'H' word: Halal. It's the kind of marinade you won't want to stomach! Audrey Russo is the Host of the weekly REELTalk Radio Show and the co-host of WOMANTalk Radio Show. She handles Middle East Issues/National Security/Terrorism for their eZine and writes on foreign affairs for The Examiner.com. She guests on several radio shows including The Rick Amato Show, The Simon Conway Show, The Pat Campbell Show and The Mike Wiley Show. Audrey is the Managing Editor for the online opinion journal Ediblog.com. Her articles can also be read at The Center for Changing Worldviews and the Gold Coast Chronicle as well as other online journals. She is also an active member of the NYC performing arts community as a singer and actor. http://churchandstate.org.uk/2013/10/halal-secretly-shoving-sharia-islamic-law-down-your-throat/. The image is from Paul Joseph from Vancouver, BC, Canada; Creative Commons Attribution 2.0 Generic license.